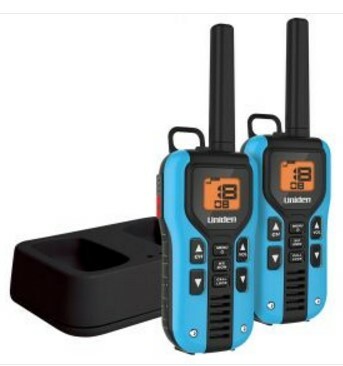 22 Channel, 40 mile range GMRS Two-Way radio pair with JIS4 water resistant housing. Features 121 privacy channels, NOAA weather with alerts, Power Boost, 10 call tones, emergency strobe light & VOX headset jack. Kit includes 6 Nimh rechargeable batteries, AC adapter with Micro USB, 2 belt clips and dual charging cradle. In Bright Blue.